We’re a devout, Catholic, homeschooling family, and we didn’t name our children after saints. This has the capacity to raise a lot of eyebrows, not the least of which belong to the priests who performed our children’s baptisms. We chose old southern family surnames for each of our kiddos, and I fully accept the fact that when I rattle off their names it sounds less like a litany and more like the roster of a Charleston graveyard. Why did we do this? Family history, for one. Genealogy is important to me, and I’ve devoted an extensive amount of time tracing family lines back to the 16th century (and visiting ancestral homeplaces, when I can find them). But we also understood that while the Church does encourage parents to name their children after established saints, virtues, or Biblical characters, it isn’t required. Our family surnames leave space for our children to connect with a personal patron – one chosen based on temperament and experiences, rather than their given name. Given those three points, we felt confident we could choose names for our children that reflected our family’s growth over the centuries. Moreover, they gave us the chance to save space for a patron who fit our children, inside and out. My friend Alison calls them her Saint Posse. My friend Amy is living proof they hunt you down. 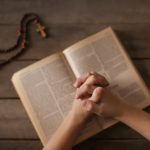 “We can and should ask them to intercede for us and for the whole world.” (CCC 2683). There are patron saints for everything, from various professions to matters of the heart. Typically, these designations are bestowed by Papal authority and based on a saint’s interests, occupations, and actions prior to death. As a result, we can select a patron at any time and for any reason. What a gift to have someone who not only understands our struggles and triumphs but intercedes on our behalf! Seasons change. Interests develop. Children grow at breakneck speed. A child’s patron saint, therefore, is something to revisit, especially at each juncture of a child’s life. “Choice” is a funny word here because, for the most part, it is really the saints who choose us. 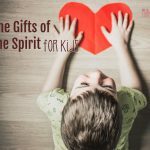 When we open our hearts to the gifts of the Holy Spirit, we are cooperating with an abundant grace. We allow Him to align us with the appropriate intercessor, a perfect patron for the unique nature He has imbued in our souls. How do we know the truth of that alignment, though, when it’s not always easy to determine God’s will? 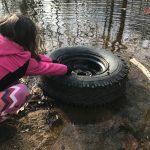 Add in the complicating factor that our children are their own individual people, and the process can seem daunting, at best. This is when I turn to pen and paper and start keeping track of my observations and thoughts. I take a moment to consider my children’s personalities, interests, strengths, and weaknesses, and ask the Holy Spirit to guide my choice. Where does this child fall in line with his/her siblings? What role does he/she play in the home? Is he a peacemaker? A motivator? Mischevious? A Goof? 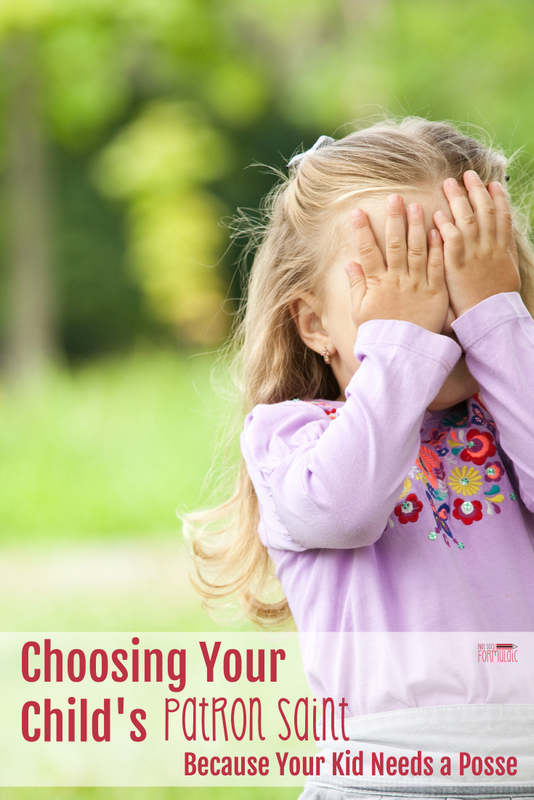 In what ways does your child shine? Does she have strong interpersonal skills? Does he have a strong devotion to his faith? Does she love math? Science? Does he enjoy sports? Theater? Music? What special concerns do you have for this child? Are they developmental? Behavioral? Both? In what areas would you like to see your child grow and become stronger? This is perhaps the hardest part, because the response may not always seem immediate. Ask the Holy Spirit to open your heart to His voice and give you guidance as to the right patron for your child. If your child is enough, you can ask him or her to join you in prayer. Ask your child what saint, if any, he has a special affinity for, and take that into account as well. If you don’t have an answer yet, make a list of the possible matches rattling around in your head. Take a look at this patron saint index (searchable by topic) to consider other options as well. 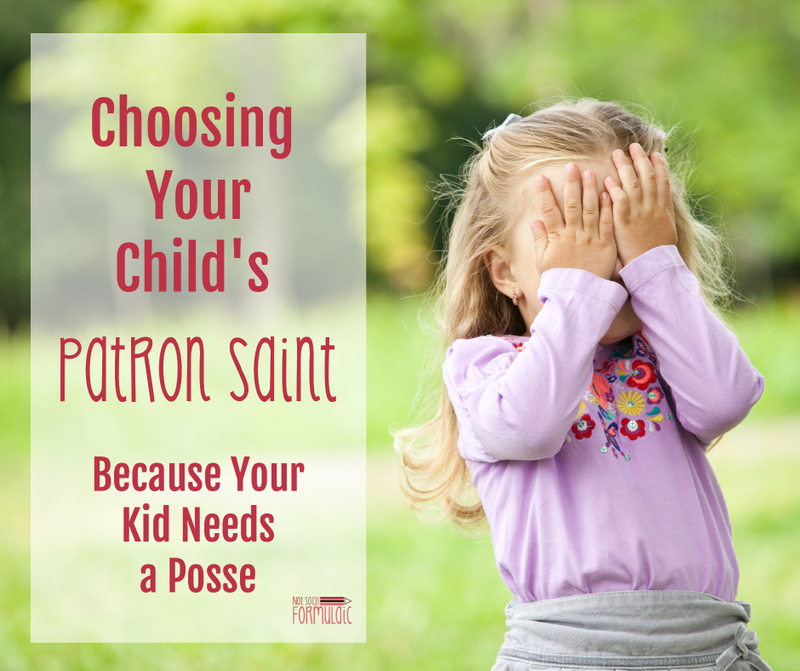 Choosing a patron saint for your child isn’t rocket science, but it isn’t a magic trick, either. It is a process of contemplation, prayer, and discernment, wherein the Holy Spirit provides wisdom and knowledge. Sometimes that knowledge comes easily (my two oldest are definitely Francis of Assisi and Joan of Arc), and sometimes it takes a while (I’m leaning toward Bl Pier Giorgio Frassati for my youngest, but John Paul the Great is a front-runner, too). In any case, we cooperate with God’s grace in every aspect of our parenting, and the selection of an intercessor is yet another opportunity to work in and through that love. My children may not be named after saints directly, but they’ve still got a powerful posse up above. 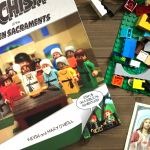 Want a little help discerning your child’s saint posse? Download this handy worksheet and keep your thoughts in one place! Just popping in to say that my oldest daughter was named after a fictional character from “The West Wing” and my second was named after a city that was near and dear to my grandmother’s heart. I love that you explains that not naming our children after saints is totally okay and within the confines of Canon Law. Thanks. Sometimes people make it seem like it’s a big no-no, and it’s not. Both of my kids bear their patron saint in their legal names. This third one? 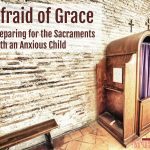 His patron (St. John Bosco) came to me while I waited for an OB appointment one day – before we knew we were having a boy. Only problem? The name doesn’t quite fit with “the playground test” – ensuring if it is the first name, he’d be mercilessly and relentlessly teased with his peers. We could use it as a middle name, but gosh – naming is hard work! I love that yours are so steeped in family tradition and recognition! This is such a great idea!! 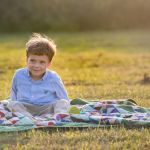 I love that you are spending that thoughtful time really analyzing what saint would match the personality of your children – you can tell through that exercise that you are truly devoted and intuitive mama! 🙂 I’ll keep this in mind for future kiddos. Okay, Ginny, I love this idea! We haven’t been very particular about naming our kids after Saints. And I think you’re totally right that we just CAN’T know their temperament and personality to pick a patron Saint before they’re born lol. So I love the idea of just discerning and picking patron Saints as they grow and flourish! Soooo going to do this. And I’m going to STOP feeling bad about NOT naming our kids after Saints. Thank you! You’re welcome! It’s definitely NOT required.